Does anyone know if the Dreamcast official VGA box is just a straight connector without intervening electronics, i.e. equivalent to just a cable? If so, does anyone know where I can buy a high quality cable - the official box is very expensive now. I have a Toro VGA box, but Digital foundry reckons the colours are off and it has slight pixel scaling issues. it's pretty much just a cable, yes. Retro Gaming Cables just announced a new 31khz capable Scart cable for the DC, using a newly designed connector on the DC's side. They will certainly the same cable with a straight VGA output as well. Might be worth looking into. The Scart version is obviously meant to connect to either a good scart switch like the GScartSW or directly into the OSSC (which processes both 15 and 31khz video on its Scart input). I'm looking forward to solutions from some real accomplished electronical engineers (with some transparent dev and testing) like HDRetrovision. I'm hoping Retro Gaming Cables will put in the time to get it right as well. As for Behar Bros, the Garo thing makes me question everything they sell. Will it have a switch to go between 15 and 31khz or will it just do the latter? Interesting that the official SEGA box blows out some details going by those comparison shots. Last edited by Gunstar on Sun Apr 14, 2019 9:04 pm, edited 1 time in total. It does, but adding a very small resistor to each of the RGB lines will solve this completely. I think I settled on about 10 ohms on mine. My experience with other brands of VGA boxes (one of the old transparant ones) does indeed confirm what Digital Foundry says. Years ago I ran my Dreamcast through a Gefen DVI Scaler exclusively and I was only able to get pixel perfect scaling using the original box from Sega. Thanks all, the info is very much appreciated. So is it likely that retro gaming cable’s 31khz cable is likely to be as good as the official VGA box plus 10 ohm resistor combo - i.e. perfect scaling with perfect levels? It sounds like that hasn’t been achieved yet by any solution. I would think so. Otherwise they'd have a hard time to compete with the 15 EUR VGA cables available on ebay. It sounds like that hasn’t been achieved yet by any solution. Nope, this is why I have been waiting for it since the past few months. There's also another option: thefoo.83's cables. Custom made cables from Poland (I think?) sold through ebay. I used to use retrobit's clear VGA box which was OK quality wise, but had noisy audio and slightly noisy video. thefoo.83's VGA cable performs much better in that regard. I believe his cables include capacitors in them just like a VGA box; however, I'm not 100% sure. I just remember reading a thread on here and he mentioned it I believe. If someone could clarify that would be great. As far as color accuracy goes, I'm not sure how thefoo.83's cable fares because I didn't even know that was an issue with some of these boxes. I'm also kind of curious as to why that's the case. Maybe it's a function of the DC's RGB output being uneven level wise across the red, green, and blue signals, or maybe it could also be the capacitors being slightly off spec from each other. *as in previously some equipment would struggle with detecting sync properly. 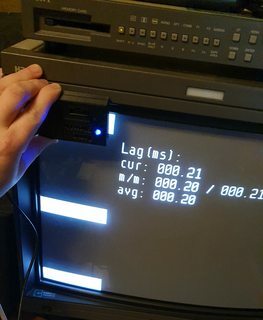 For anyone who actually happens to have a 480p CRT and DCHDMI, I hooked mine up with a Portta HDMI -> Component transcoder and the picture looks great, it also solves that annoying sync issue BVMs have with VGA resolutions. So you're saying it's a function of the DAC on the Dreamcast then? Do we know if the upcoming Retro Gaming Cables Dreamcast scart cable corrects all these issues out of the box? The only photos they have posted are of the console-side PCB. The console-side PCB does not have any components whatsoever on the RGB lines, they pass straight through untouched, all the circuitry on this PCB is for the sync combiner circuit. I would assume the SCART plug side at least has the requisite 220uf coupling caps, but that's probably all it will have if I had to guess. Having been completely unable to locate a photo of the SCART side PCB, all I can do now is speculate. Ahh interesting - so this could turn out to be no better than other solutions for 480p? If the native 480p from the console blows out the image a bit, one wonders why they didn't just add the small resisters as Konsolkongen did? The issue as it has been explained to me by Fudoh a few times, is that the video levels and RGB levels of the Dreamcast are overblown compared to the standard (basically they are higher than what your display would expect), that is because the Dreamcast is based on arcade hardware (the Naomi). I was hoping that the Retro Gaming Cables would introduce an easy out of the box fix to these issues. Ahh thanks - and thanks to Fudoh, as always. If turns out that the RGC Scart cable turns out to not fix any of these issues, are there any cables that are out of there which brings the RGB levels and Video Levels to standard? Thanks, guess I'll start to look out for this one now. Anybody have any measurements on what the levels are? I assume these would be fixable via OSSC and maybe the 240p test suite? Just ran some tests via the 240p test suite through my OSSC, and I managed to remove the clipping. I adjusted the pre-ADC gain on my OSSC to 6 (default 8). I also lowered the G/Y and R/Pr offset to 126 (default 128) as there was a slight hue in the darker IREs (not present when tested with other equipment). Finally, I lowered G/Y gain to 20 (default 26) as green was still clipping. Looks like the Dreamcast DAC is not that great. Boosted levels, slightly noisy video, and slightly uneven colors.